The new MacBook Air is a welcome upgrade with a sharper screen in a thinner and lighter design, but this laptop could use more power. When Steve Jobs pulled the first MacBook Air out of a thin envelope in 2008, it began a revolution in laptop design that inspired ten years of imitation. But in that decade, the MacBook Air stagnated while the rest of the market picked it up and then surpassed Apple’s iconic portable. And now, in 2018, the once-beloved MacBook Air finally gets the function it needs most. Yes, that high-res Retina screen that Apple gave the MacBook Pro in 2012 finally arrived on the MacBook Air. That is just one of many, many changes: this new MacBook Air also offers users a Touch ID sensor for biometric security, super fast SSD storage, great sound, and dual Thunderbolt 3 ports. The new device from Apple is also better for the environment because the machine is made of 100 percent recycled aluminum. But is the new MacBook worth it? You’ll surely find out all your answers in our Apple MacBook Air Review. The curves of the lid and the bottom of the new MacBook Air and the edges of the screen are tapered from previous years. 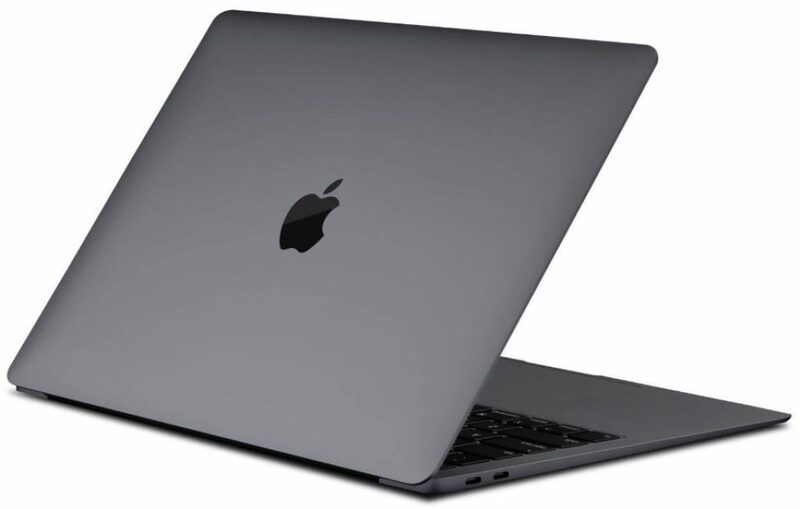 This makes the MacBook Air look like a brother and sister – and not a long-lost family member – on the MacBook Pro and the 12-inch MacBook (which you would now love to buy). The Air’s iconic wedge design is intact and helps distinguish the machine from those other laptops. While the Air is being sold in traditional silver and a new golden hue, the model we have tested is a Space Gray that looks pretty attractive. Apple made these new MacBook Airs from 100% recycled aluminum, but you could not see it on the device. This processed metal looks and feels just like the same material that Apple used for previous MacBooks. The MacBook Air has two fast Thunderbolt 3 ports (which allow much faster data transfer rates) on the left, with a headphone jack on the right. That may be an upgrade of the single, slower USB Type-C port of the MacBook, but compared to most competitors, it lacks Type-A USB ports. 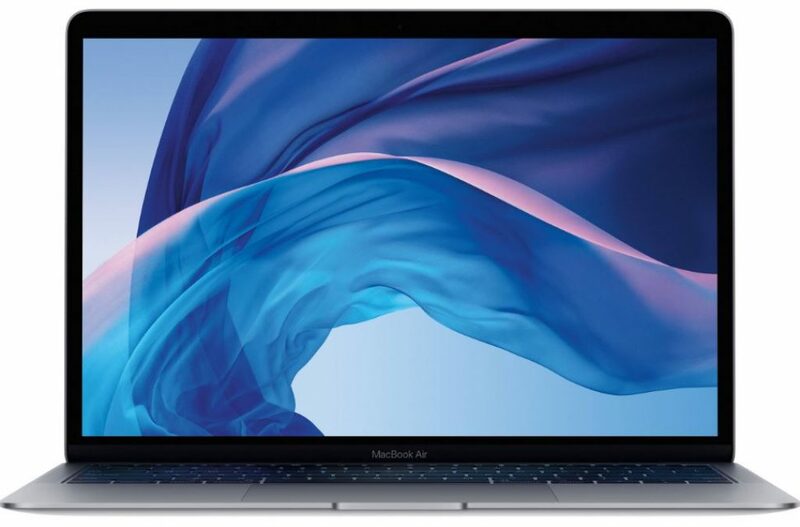 With a weight of 2.7 pounds and a thickness of 0.6 inches, the MacBook Air is slightly lighter than our favorite MacBook copycat, the Huawei MateBook X Pro (2.9 pounds, 0.6 inches). The new Air is comparable in size to the Microsoft Surface Laptop 2 (2.7 pounds, 0.6 inches) and the Dell XPS 13 (2.7 pounds, 0.5 inches), but the HP Spectre 13 (2.4 pounds, 0.4 inches) is both lighter and thinner than the Apple machine. I have never been a fan of the butterfly switch keys that Apple uses, but I’m starting to accept them. the keys’ required 70 grams of activation power (we look for at least 60 grams) and have a meager travel distance of 0.6 millimeters (1.5 to 2.0 is preferred). Typing experience seems okay on this keyboard. But for beginners, it will take some time getting used to this butterfly mechanism keyboard. 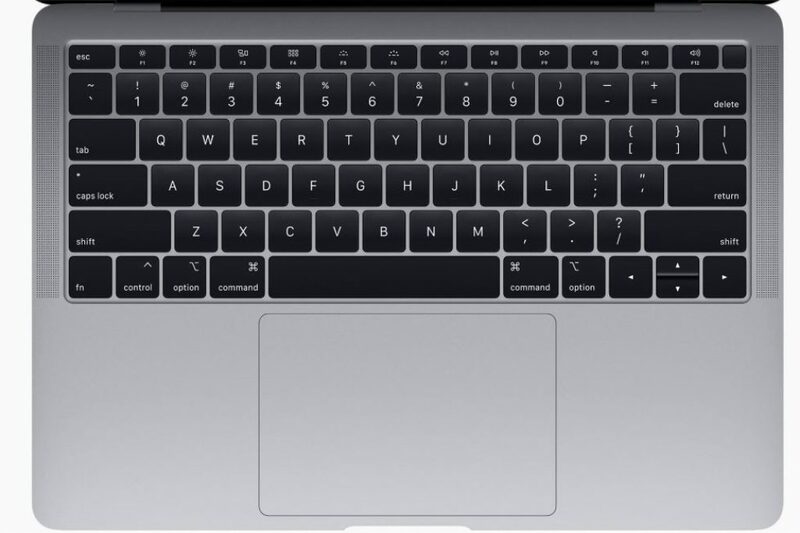 Apple has also changed the touchpad of the MacBook Air from a traditional clickable surface to the full-glass Force Touch trackpad, just like the 12-inch MacBook and more expensive MacBook Pros. This 4.6 x 3.1-inch surface ensures accurate input recognition and smooth scrolling. The bigger difference is that the Force Touch nature of the trackpad means that Apple gives you the illusion that the touchpad moves, through haptic feedback. The Retina display with 2560 x 1600 pixels is the true star of the new MacBook Air and offers sharp details and solid colors. When I watched the first episode of The Chilling Adventures of Sabrina, I saw rich red colors in her coat, lush green foliage in a creepy forest and vivid pink neon in a movie theater. When I watched a 4K video of the Colorado Rockies and a nearby pond, I saw lots of details, including small ripples in the water and small, sharp, jagged rocks at the tops of the tops. In terms of color output, our colorimeter scores the MacBook Air panel with 109 percent of the sRGB range, a brand that is a bit shy of the average of 116 premium notebooks (laptops around $800 and more) and close to 111 percent of the Spectre 13. We saw higher scores of the XPS 13 (130 percent at 1080p, 117 percent at 4K), the Surface Laptop 2 (176 percent) and the MateBook X Pro (124). The HP Spectre 13 hit a similar 111 percent. Although Apple assesses the Air’s panel as capable of producing 300 nits of brightness, our unit has a maximum of 234 nits, which is close to the 247-nit Spectre 13 and less than the 317-nit premium notebook average. We found clearer screens in the XPS 13 (372 nits at 1080p, 415 nits at 4K), the Surface Laptop 2 (321 nits) and the MateBook X Pro (458). 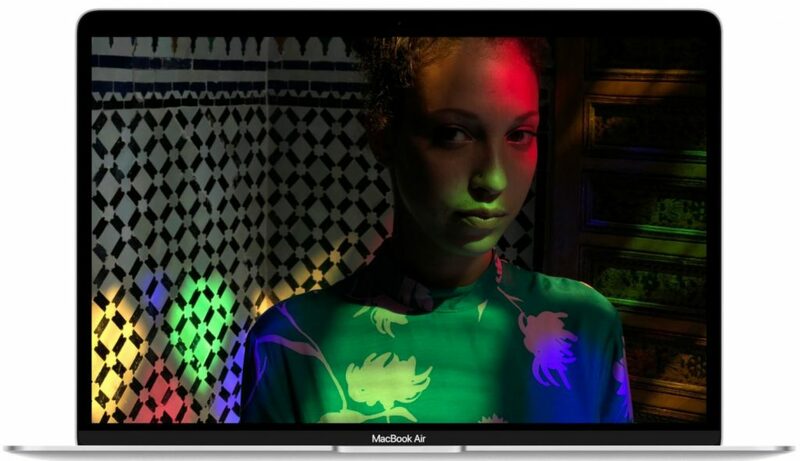 Apple MacBook Air includes the Intel UHD Graphics 617 as an integrated chip. The Air had the OpenGL part of the Cinebench R15 benchmark, which measures the graphics performance, with 35.3 images per second, which is a big part of the 49.3 fps of the XPS 13 (Intel UHD Graphics 620). The Air struggled with the modestly demanding racing game Dirt 3 (set to medium graphics at 1080p), with which the machine turned 21.5 frames per second. That is below the 30 fps and far below the premium notebook average of 71 fps. This MacBook Air produces a really decent sound. When the laptop filled our big newsroom with the sweet melodies of Carly Rae Jepsen’s “Party for One”, I noticed the strong bass of the song, clear vocals, and fresh drum cymbals. Do not worry if pop music is not your atmosphere. The hard post-punk rock of Idles’ “Colossus” sounded excellent in the air, especially the growling guitar riffs of the tune. Apple praises this Air because it offers twice as much bass and 25 percent more volume compared to the 2017 MacBook Pro, and I’ve used both, I believe those claims. When I discovered that this MacBook Air now comes with an Intel Core i5-8210Y processor, my head was mesmerized. Y-series processors are known for offering less-than-premium performance, as found in the decidedly 12-inch MacBook. Yes, the Air may not be the Pro-class laptop from Apple, but with its starting price of $1199 (including 8 GB of RAM), it is a premium level product. So I went about testing this machine with a strong eye on performance, both on synthetic tests and in daily use, to see if I could rely on it as my daily work machine. I saw minimal pauses when I switched between apps and web pages after I added 17 Safari tabs, five Chrome tabs (including the Google document for this article, a YouTube video, and Netflix), iTunes, Messages, Photos (synchronization of my 80,000 +) had opened iCloud photo library) and Mail. The MacBook Air continued to respond while loading TweetDeck, Pixelmator, and Bear, three of the other apps I use more than others on my Mac. 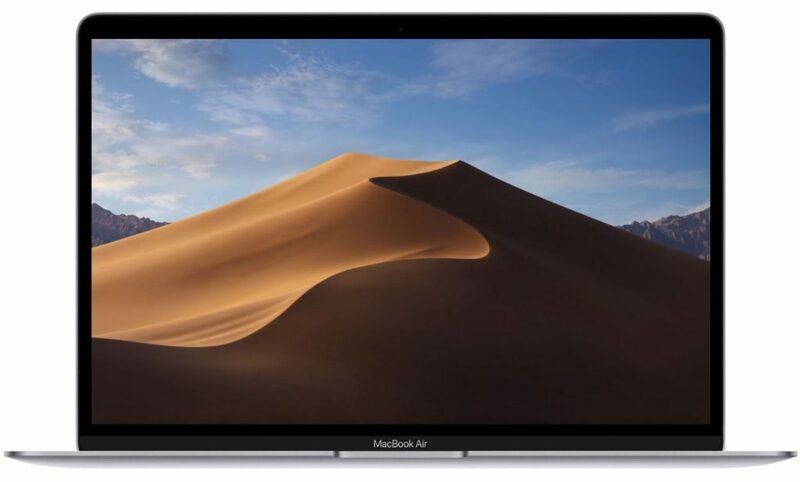 The MacBook Air recorded a 7,871 on the overall performance measure Geekbench 4.3, accounting for about two-thirds of the category average of 12,230. We saw higher scores of comparably priced laptops with faster U-series processors, including the Core i5-8250U-based XPS 13 9370 (13,254), the Core i7-8550U-based Spectre 13 (13,090), the Core i5-8250U based on Surface Laptop 2 (12,744) and the Core i7-8550U based MateBook X Pro (13,769). All these PCs were tested with 8 GB of RAM, except the MateBook X Pro, which had 16 GB of RAM. The MacBook Air seems to compensate for that weak performance with great SSD performance because the Blackmagic drive test clocked the writing speeds on the 256GB SSD of the Air with a stunning 2.1 gigabytes per second. To put that in perspective, the category average for premium laptops is 500.1 megabytes per second. The SSDs in the XPS 13, HP Spectre 13, Surface Laptop 2 and MateBook X Pro all performed at speeds of 203 to 508 MBps, which is a fraction of what Apple’s laptop has delivered. The MacBook Air took a long time of 3 minutes and 26 seconds to complete our Excel VLookup test (which matches 60,000 names with addresses), a time that is more than twice as long as the average of the category 1:34. The XPS 13 (1:08), Surface Laptop 2 (1:15) and MateBook X Pro (1:49) all ran in faster execution times. The 100% recycled aluminum chassis from Apple is warm, but not too hot. After 15 minutes of full-HD video streaming on the Air, our heat gun captured temperatures on the touchpad of the laptop (84.5 degrees Fahrenheit), the keyboard (91.5 degrees) and the bottom (93 degrees) below our 95-degree comfort threshold remained. The air can be a bit warm if you hold it on the spot at its hinge after some serious work because that specific location came in at 96 degrees. Historically, the MacBook Air is popular for its long battery life. This year’s model has lasted a solid 9 hours and 32 minutes on our Battery Test (surfing the internet with 150 nits) – defeating the 8:09 premium notebook average. However, that operating time is lower than the “up to 12 hours of wireless internet” claimed by Apple and less than 9:55 times from the MateBook X Pro. XPS 13 owners get more life with a screen of 1080p (11:59) and a shorter life with a 4K screen (8:23). The Spectre 13 (5:16) lasts less and the Surface Laptop 2 (9:22) was slightly behind the MacBook Air. From its high-res screen and its thinner and lighter design to its Thunderbolt 3 ports, the new MacBook Air feels like the modern update that Apple fans have been waiting for. I wish Apple had chosen a better processor because competing Windows machines are faster, although Apple’s flash storage is superior. The Dell XPS 13 from $1099 offers faster performance and hours of extra endurance for $300 less, although the 1080p screen is not that sharp. If you need that Type A port, the $200 affordable MateBook X Pro is worth watching, although the webcam (like the XPS 13s) is in a strange place. Although the MacBook Air is more expensive than we would like, it is still a fantastic laptop and the best Mac OS device for most people. That’s it with our Apple MacBook Air Review. Let us know your thoughts on this latest MacBook from Apple in the comments section.